Set in the steampunk era, you take on an expedition to a forsaken island that you once called home. But sudden eruptions triggered by mechanical beings turned the wondrous place into an apocalyptic wasteland. In order to survive the island's natural elements, you have to outsmart these creatures and capture one of their drillships. Use their own technology against them as you upgrade the machinery and reclaim your homeland. 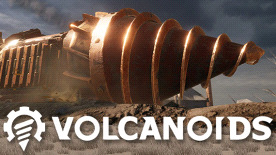 Deal with a hostile race of robots that use the volcano as a source of energy. Their units are scattered all around the island's surface as well as below it. Future releases may require more hard drive space.